This frame grab from video provided by the Thiqa News Agency shows rebel gunmen at the site of a blast that damaged several buses and vans at the Rashideen area, a rebel-controlled district outside Aleppo city, Syria, April. 15, 2017. Scores of people set for evacuation from two besieged towns in northern Syria were killed and many others were wounded Saturday in an apparent car bombing that targeted a bus convoy carrying them to safety. Rescue workers combed through the wreckage near the northern city of Aleppo into the night. The Britain-based Syrian Observatory for Human Rights said Sunday at least 112 people had died in the attack, with the death toll expected to rise. Most of the victims were believed to be residents of two Shi’ite villages that had been surrounded by Islamists for months. There was no immediate claim of responsibility. But Sunni jihadist groups, including the Syrian affiliate of al-Qaida, operate in the area and routinely attack Shi’ites, whom they consider apostates. The U.S. embassy in Syria tweeted, "The United States strongly condemns today’s barbaric attacks against innocent civilians, including women & children, in northern #Syria." 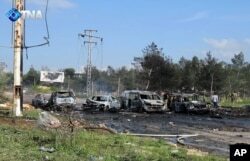 This image released by the Thiqa News Agency shows charred and damaged cars at the scene of an explosion in the Rashideen area, a rebel-controlled district outside Aleppo city, Syria, April. 15, 2017. A deal between the Damascus government and opposition fighters guaranteeing the safety of the villagers stalled Friday, stranding thousands of evacuees for hours before the attack unfolded on the outskirts of Aleppo. Video on state television later showed charred bodies and mangled buses, which had been carrying pro-government Shi’ite fighters and civilians from the besieged villages toward the government-controlled city. Other footage showed ambulances ferrying the wounded to area hospitals. Far to the south, the evacuation deal — brokered by Iran and Qatar — simultaneously granted hundreds of Sunni insurgents and their families near Damascus safe passage to Idlib province near the Turkish border. People who have evacuated from Madaya, a government-besieged town near Damascus, in an agreement between rebels and Syria's army, arrive at insurgent-held Idlib city, Syria, April 15, 2017. By late Saturday, monitors from the Observatory said the convoy near Aleppo was again under way, while official Syrian media said the first buses carrying Shi’ite evacuees had reached government safety in Aleppo.